This debut novel—about taking risks and facing danger, about love and art, and about growing up and coming out—will make its way straight into your heart. Fig, a sixth grader, wants more than anything to see the world as her father does. The once-renowned pianist, who hasn’t composed a song in years and has unpredictable good and bad days, is something of a mystery to Fig. Though she’s a science and math nerd, she tries taking an art class just to be closer to him, to experience life the way an artist does. But then Fig’s dad shows up at school, disoriented and desperately searching for Fig. Not only has the class not brought Fig closer to understanding him, it has brought social services to their door. Diving into books about Van Gogh to understand the madness of artists, calling on her best friend for advice, and turning to a new neighbor for support, Fig continues to try everything she can think of to understand her father, to save him from himself, and to find space in her life to discover who she is even as the walls are falling down around her. Nicole Melleby’s Hurricane Season is a stunning novel about a girl struggling to be a kid as pressing adult concerns weigh on her. It’s also about taking risks and facing danger, about love and art, and about coming of age and coming out. And more than anything else, it is a story of the healing power of love—and the limits of that power. 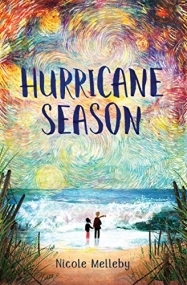 HURRICANE SEASON is a powerful middle grade novel that deals with some really important issues. Finola (nicknamed Fig) is in sixth grade. She has lived with her father only since she was born and her mother left. Her father is a famous musician, but he stopped composing around the time she was born- he still tries, but he is not able to finish the pieces. He is also eccentric, and as we learn later, mentally ill. Fig wants to understand her father, why he is drawn to the hurricanes and wants to stand on the shore in New Jersey, where they live, and watch them come in. She is more mathematically and scientifically inclined, but she signs up for art as an elective to try to understand her father better. It is this class that her father barges into searching for her desperately and that leads the teacher to call Child Protection and Permanency (CP&P). Fig now wants to understand her father more than ever and convince CP&P that they are okay together. In her search, Fig learns about Vincent Van Gogh, and seeks more information about him, noting all the parallels between Van Gogh and her father. At the library, a high school girl helps her to find books and information about Van Gogh, and Fig begins to notice something else about herself- she is attracted to the girl who works at the library. Holding all the pieces of her life together, Fig is beautifully crafted and real, and readers will whole-heartedly fall in love with her. This is a beautiful story of healing, hope, and connection that will reach out and touch your heart. I recommend for middle grade and older readers- the messages and storylines in this book will appeal to a broad audience. The portrayal of mental illness is really well done, and I appreciate that we also see the healing. The connections of community and interweaving of art into the story is just lovely. This is a powerful story set around hurricane season that does a fantastic job of dealing with mental illness and LGBT/coming-out in a young and well-crafted character. I highly recommend for readers of middle grade contemporary novels.